Sirius is a star system which is 8.6 light years away from Earth. One light-year is nearly 6 trillion miles. It consists of two stars, Sirius A is the main sequence star and Sirius B is a small white dwarf. Sirius B has a highly elliptical orbit around Sirius A. This binary star system is located in Canis Major, near Orion. It is the brightest star in the night sky. It is twenty times brighter than the Sun and has a temperature exceeding it by 4000 K. It is approximately 40% larger in size compared to the Sun. The name of this star has been derived from the Greek term Seirios that means “glowing”. This star system is approximately 300 million years old, and was previously composed of two huge bluish stars. It is also the closest star that can be seen without a telescope. It is known by various other names including the “Dog Star” and “Alpha Canis Major”. Sirius B has a temperature of around 25,200K which makes it hotter than Sirius A. This star is one of the 27 stars on the Brazil flag and it depicts the state of Mato Grosso. 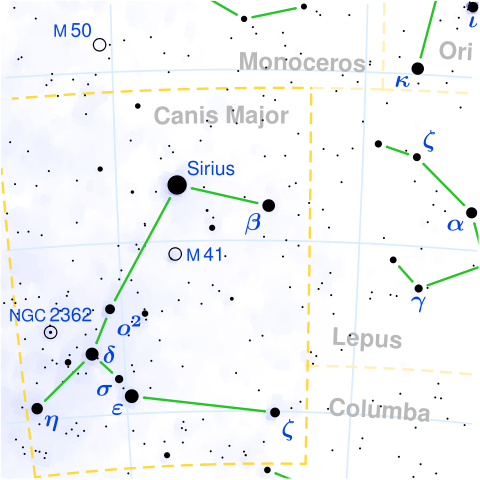 Originally, Sirius B was a B-type star. It had about five times the mass of the Sun. There are also speculations that there is a third star that exists in this star system but so far there is no evidence to confirm this. Sirius A has a radius of 740,000 miles and Sirius B has a radius of approximately 3,650 miles. Declan, Tobin. " Fun Sirius Facts for Kids ." Easy Science for Kids, Apr 2019. Web. 26 Apr 2019. < https://easyscienceforkids.com/sirius-facts/ >.